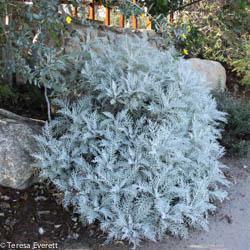 This shrub has beautiful silvery foliage that contrasts beautifully with its golden flowers. This is a plant that truly lives up to its name, silverlace, as the foliage really does look like a silvery lace. It does well in coastal areas as it isn't particularly frost tolerant. It would make a great border plant in a butterfly garden as well.